Dandy: Zeuon No Fukkatsu (ダンディー ゼウオンの復活, Dandy: Zeuon No Fukkatsu? lit. 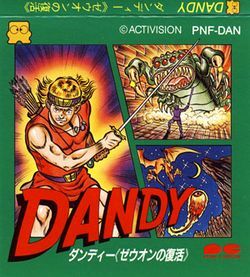 Dandy: Zeuon's Revival) is an adventure game developed by Atelier Double for the Famicom Disk System, and published in Japan by Activision in 1988. It is primarily based on the original Atari 8-bit computer game Dandy which came out in 1983 and went on to inspire the arcade classic Gauntlet. Having obtained the license to publish the game in Japan, Activision adapted the game to include more modern elements such as an overworld as well as underground dungeons, so the game plays like more of a mix between Gauntlet and The Legend of Zelda. The game was only published in Japan, and has never been translated from the original Japanese. This page was last edited on 6 November 2014, at 01:58.